About two weeks ago, Xiaomi unveiled their latest top-of-the-line device in the Philippines, the Mi 8, which most, if not all, tech enthusiasts present during the event are left in awe. This is mainly because of its high-end specs and very reasonable price tag. But, it is not just Xiaomi that made a pleasant announcement this month, another Chinese smartphone maker, Huawei, also surprises the local consumer when they revealed the Nova 3, the most premium handset to date in the Nova series. Both Android phones have an SRP of just Php25,990, which in most cases is the asking price of many mid-range offerings. But, for Xiaomi Mi 8 and Huawei Nova 3, the said retail price already equates to flagship-grade hardware. And, we decided to pit them against each other to know which one deserves more applause. Let's start first with the rundown of their specs. The Huawei Nova 3 has a slightly bigger display and more pixel per inch, but at 0.09-inch advantage and 7 PPI respectively, it will be hardly noticeable. What is noticeable though is the notch, the one at the top of the Nova 3 is smaller than the Xiaomi Mi 8, allowing it to have more items in the notication area. However, the Mi 8 edges its opponent with a layer of Corning Gorilla Glass 5 on its screen. In terms of physical dimensions, the Mi 8 is shorter, but a bit wider and thicker. And, it is also 9 grams heavier. Under the hood, the two phones use different silicon chips, the Huawei is equipped with its in-house HiSilicon Kirin 970 SoC, while Xiaomi comes with Qualcomm's most powerful chipset, the Snapdragon 845. Both have powerful computing and graphics rendering ability, but based on our experience, the SD845 always performs better than the Kirin 970 in benchmarking applications. Both devices also have 6GB of RAM, however, the Nova 3 has a base storage capacity of 128GB without extra charge, while the Mi 8 starts at 64GB with an option to go for 128GB for additional 2000 pesos premium. Not only that, the Mi 8 has no MicroSD card slot, which simply means there is no built-in room for storage expansion. Moving on to the camera department, the main shooters of the Nova 3 offer more megapixels than the Mi 8, that is 16MP and 24MP as opposed to 12MP + 12MP of the latter. However, the dual camera implementation of the two devices differs. For Huawei, they separated the color and monochrome sensor, while for Xiaomi, the first sensor has a dual pixel technology and the other one is for optical zoom. Therefore, the quality and functionality of the two are cannot be directly co-related. Meanwhile, the Nova 3 has an advantage when it comes to selfie, as it has dual camera set-up with more pixels too. Connectivity wise, the Mi 8 has dual-band GPS system making it more accurate in when using any location-based application. It also has a newer Bluetooth version, and has NFC too. The Nova 3 bounces back having a 3.5mm audio jack as well as FM radio receiver. When in comes to raw power supply, the Nova 3 has more reserved juice than the Mi 8, that is 3750mAh versus 3400mAh, although the difference is not that significant. Both devices support fast charging, but none for wireless charging. Of course, specs don't say it all, the software, real-life performance and user experience are important factors too. 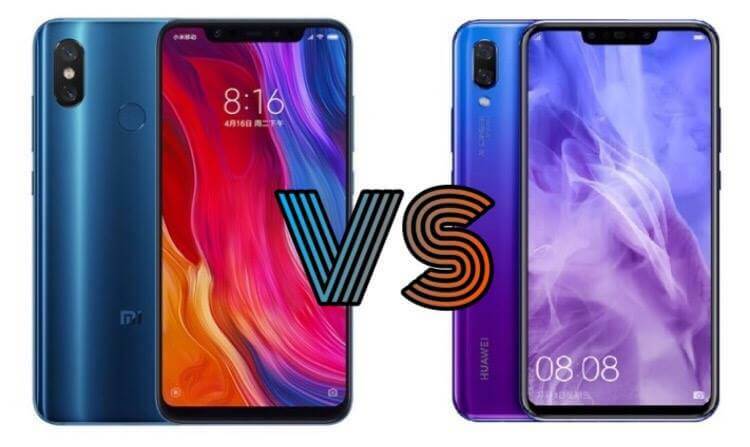 However, both the Huawei Nova 3 and Xiaomi Mi 8 deserve recognition and applause for offering top tier hardware with asking price that is easy to swallow. But, if we are to rate them by point system, let us say 1 to 10, we will give the Nova 3 a half point advantage, this is because of larger internal storage and an option to expand it further. Do you agree with us guys? Or you have a different opinions? Please share your thoughts with us! !